The Bill Cunningham I grew up with was the one of the weekly On the Street videos, highlighting patterns he noticed in the style of everyday New Yorkers. Every Friday, I would watch a two minute clip of Cunningham providing commentary on photos of well-dressed women on my family’s Mac desktop. As a middle schooler, I didn’t realize how much he had adapted to the changes in technology and the fashion world. His On the Street video series began in 2013. Little did I know, he had been a Times columnist before online videos and before Internet itself. In Fashion Climbing: A Memoir with Photographs, Cunningham writes of his fashion-filled life from age four in 1933 to just before he became a columnist for the New York Times in the 1970s. According to Cunningham, his first fashion-related memory involved his mother “beating the hell out of him” for wearing his sister’s prettiest dress. Even then, little four year old Bill knew he loved clothes to the point that he was willing to risk corporal punishment. This incident is indicative of Cunningham’s persistent authenticity throughout his life. He grew up in a conservative middle-class Irish Catholic family who saw fashion as something for girls and hoped that Bill would stay as far away from it as possible. Despite his parents’ attempts to keep him away from pretty dresses, Cunningham forged his own path in the fashion world. 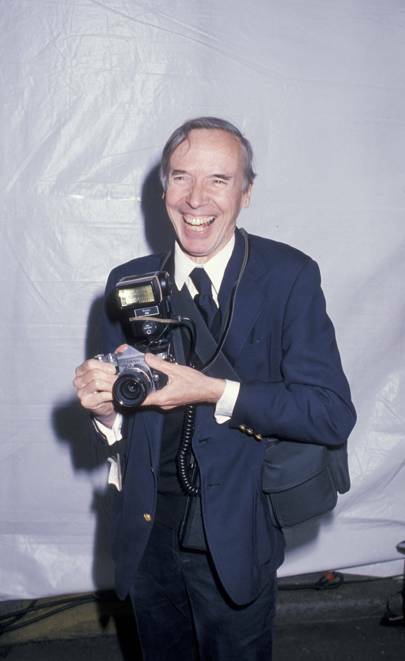 In an industry where you need the right invitation to get your foot in the door, Bill Cunningham always found a way to sneak in. Cunningham’s fashion education was a bit of an unorthodox one. He found experience in the fashion world by working as a stock boy in Bonwit Teller, a New York-based luxury department store. Eventually, he moved to New York and began his career as a hat designer. Cunningham’s hats were anything but simple. His design motifs ranged from fruit to fish to giant clam shell. While these eccentric hats were hard to sell, he never once tried to conform to the trends of the time. He remained true to himself throughout his designing career despite his many financial setbacks and lack of economic stability. There was no stopping Cunningham from pursuing his fashion career dreams — whenever there was an obstacle, he would find another way. But by 1960, he knew his time in the millinery business had come to an end. Cunningham had dedicated his design career to creating hats “with flair and excitement,” but he eventually grew tired of his peers who were more concerned with climbing the social ladder and the industry’s exclusivity. His next venture in the fashion world came through a job with Women’s Wear Daily, where he became a columnist. Cunningham reported on fashion with complete honesty and disregard for niceties. He was primarily concerned with clothes as opposed to the famous people wearing them. Cunningham was not afraid to call out copycat designers who lacked in originality: his review of a Dior show criticized the couture house for “how the designs were mostly a rehash of the past years’” (170). His honesty and integrity got him in a lot of trouble with his editor, and a bad review of a Bonwit Teller show led to the president of the brand punching Cunningham in the face. Eventually, the editor of Women’s Wear Daily felt he could not tolerate Cunningham’s unabashedly honest fashion reviews, and he was ousted in a rather manipulative way. Cunningham’s love of women’s clothes never ceased to end, and he continued to write for other publications until he eventually landed a permanent position at the New York Times. He seemed to push buttons everywhere he went because of his unrelenting commitment to the search for originality. Even though the world was rapidly changing around him, he managed to always stay true to himself. His one rule for fashion? “When you feel you know everything, and have captured the spirit of today’s fashion, that’s the very instant to stand everything you have learned upside down and discover new ways in using the old formulas for the spirit of today. Constant change is the breath of fashion” (237). Cunningham understood that the world is a fast-paced place and we must progress with it, but he also felt it imperative that we hold on to our integrity. So while our world is on an inevitable path to complete digitality, we must remain authentic as we continue to design, innovate, and create original ideas that fit the spirit of today.